Quasars, Redshifts and the "accelerating-expansion" Universe. 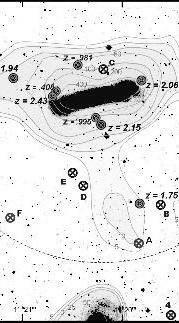 This page provides links to the HMQ quasar catalog, the MORX catalog of radio/X-ray associations and the ASP optical catalog, plus a few informal treatises on what we know, or can know, about our Universe. New: The Milliquas (Million Quasars) catalog version 6.0 -- quasars to 15 March 2019. This edition totals almost 2 million objects. Get it here. The All-Sky Portable Optical Catalog (ASP: 2017, PASA 34, 25) presents 1.16 billion optical objects in an all-sky downloadable catalog. More details at its page here. The Million Optical Radio/X-ray Associations catalog (MORX: 2016, PASA 33,52) is available here. It maps large-survey radio and X-ray sources onto 1,002,855 optical objects. There also is a supplemental file which adds 118,200 objects to the MORX total. The Half Million Quasars catalog (HMQ: 2015, PASA 32, 10) is available here. The count is 510,764 quasars, AGN and type 2 objects, including those of SDSS-DR12Q. Superseded catalogs: ARXA (2010, PASA 27,283) is here. QORG (2004, A&A 427, 387) is here. A photo collection of QSOs/candidates positioned within galaxy disks (on the sky) is here, but nominal candidates within galaxy disks are usually due to bluish starburst zones and deblending artefacts. The fun is to find the true quasars amongst them. A fun radio-optical anomaly (see 2nd graphic on left) in a 1999 Alan Stockton paper on 3C212 was commented on by me here. The radio-optical offsets are intriguing. Unfortunately it hasn't been investigated since. Is our Standard Cosmological Model "fit for purpose"? An engineer wouldn't think so, because there are three pieces of non-scientific magic built into it, being inflation. dark matter, and dark energy. These 3 are placeholders, quantifications of what we don't know, the gaps between the standard model and what is actually observed. That "dark matter" is so often elaborated as a form of matter, just shows the social power of a word. If instead the term was e.g., "gravitational scalar", then a more eclectic set of explanations would be presented. Same story with "dark energy", so the terms "dark matter" and "dark energy" are unfortunate. As for "inflation", it's a magic wand for transitioning the universe from its initial singularity to a larger universe that can be calculated and modelled. Well, magic will hold up neither bridges nor universes. Is today's cosmology run by a new generation of flat Earthers? The current Standard model is underpinned by the "flat universe", a spatial manifold of zero curvature with local perturbations. Guth's "inflation" theory provides a mechanism whereby a flat universe was attained as the result of an unknown causal process in the Universe's earliest moments. Today's cosmologists use this flat manifold in all their cosmological calculations including matter ratios, missing (dark) matter, and so-called accelerating expansion due to "dark energy". Thus, the flat universe is a crucial and indispensible platform for the Standard Cosmological Model. But this Standard Model holds that things are flying apart at high speed, which would seem very absurd except that people have grown so used to it by now. My own view is that a more general theory will remove the need for physical expansion. Thus we need a general model which subsumes the standard model just as, in relativity, GR subsumed SR. We endeavor to start by designating the Standard Model as the "Special Cosmological Model" -- special in that it requires a flat universal manifold. We now generalize this into a "General Cosmological Model" by incorporating non-flat geometries, as follows. First, a quick simple description of the geometries. In a flat (i.e., curvature=0) 3D manifold, a sphere has a surface area of 4πR². A 3D manifold with curvature<0 is called spherical and in it a sphere has a lesser surface area, similarly curvature>0 is called hyperbolic in which a sphere has a greater surface area. These "non-Euclidean" geometries are known to be mathematically complete and internally consistent just as flat space is. Note that these geometries seamlessly transition from one to the other as curvature changes. Flat space of curvature=0 is but a single point on the curvature range axis, just as, with time, the present is only a single point on the past-present-future time axis. These two paradigms look the same and may indeed be the same paradigm -- given that "spacetime" unifies 3D space with time. As we perceive time as a forward flow akin to migration across past/future, so it is indicated that spatial curvature may also be migrating from (say) hyperbolic to spherical, with "flat" space simply being the current state -- not because of any huge coincidence, but because we natively see the current curvature as flat regardless of wherever on the curvature axis it happens to be -- just as we see the current time moment as the "present" even though it is always migrating. (1) The value of lightspeed (c) varies with spatial curvature. Hyperbolic space would look to us as the same as "flat", but if you travel in it you will find that your destination is closer -- this is because the "shells of space" contain larger volumes. As distances are less, lightspeed would cover more distance, thus is faster in terms of distance. Thus lightspeed is a simple scalar measure of the background spatial curvature. Lightspeed would be invariate by some other as-yet-unmodelled measure. (2) As we look into deep space we are unknowingly looking into a universe of greater spatial curvature, thus our luminosity functions lose accuracy. It is like the whole universe is lensed darkly, moreso the farther you observe. This accounts for what is currently interpreted as "dark energy". hyperbolic with every place contiguous to all others, allowing instantaneous action over the whole, a.k.a. "inflation". With lightspeed near-infinite at that time, energy equations yield enormous energies so matter cannot be stable and the primordial explosion happens. Since then, spatial curvature would decay with time via the standard exponential decay function C(t) = C(0)*e^(-kt) where k~Hubble time. This model thus obsoletes inflation & dark energy, and provides a mechanism for the redshift by virtue of the slowing lightspeed over the æons. What we know as "universal expansion" is just a naïve interpretation (a.k.a. illusion) of the migrating spatial curvature. A remaining problem: "dark matter" should be obsoleted by the greater mass of earlier times (because more spatial curvature means more energy & mass) but it doesn't seem to be enough to account for the full amount of lensing seen, such as when a galaxy lenses a background quasar. This issue remains, although maybe I'm just under-calculating the mass. The paradigm of lightspeed decreasing with universal time puts a crimp into the modern technique of defining the length of the metre (meter) in terms of light cycles. Inflation will be seen to happen as our metre grows smaller causing old objects to measure as bigger (and heavier in metric terms), whether old standard kilograms or dinosaur bones. Issues remain but the simplicity of this General Cosmological Model appeals. Index to my 1990s postings on sci.physics/sci.astro is here. Some good speculations, others not. In early days I was intrigued by the ideas of Halton Arp, and investigated them via my catalog processing. Dr. Arp was gracious throughout, and along the way we published a paper together. In the end I found that the bulk data did not support his notion of nearby quasars, so I dropped that. 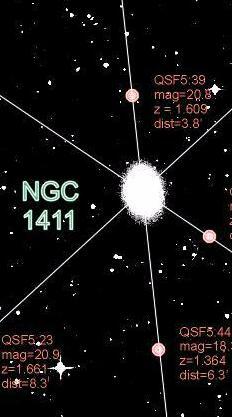 But some quasar confgurations (e.g., around NGC 3628 or NGC 1411) still echo, like looking at ghosts or Christmas tree lights, but they don't quantify into anything useful. An interesting topic is the many faint galaxies found along the line of sight to quasars -- the "proximity effect". My idea is that these might be reflections of galaxies offset further away, and that some kind of quantum shear effect is responsible, i.e. a new kind of lensing. A topic worth watching. The nature of the in-flight photon. So you still believe in Aliens? Minimalism: Bohr got it right.